As auto insurance carriers are increasingly applying automation to increase efficiencies, reduce costs and improve their competitive edge, consumers are also benefiting from increased automation – an insight we uncovered while conducting research for the 2019 Future of Claims Study. In our 2017 Future of Claims study, we looked at where carriers stand on the automated claims processing continuum―ranging from Traditional to Fast Track, and from Virtual to Touchless claims handling processing. For the 2019 version, in addition to an insurance carrier survey, we conducted a consumer survey to understand whether or not carriers’ actions align with consumer needs. Our overarching goal in conducting this research was to gather insights that can help carriers align with current consumer preferences while continuing to expand the benefits they’re gaining from automation. The good news is, for the most part automated claims processing practices dovetail very nicely with the desires for a better consumer experience―with a few important caveats. One in five consumers currently prefer claims self-service options but complain that the self-service First Notice of Loss (FNOL) process asks too many questions. 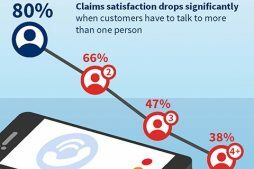 Among consumers who have prior claim experience, satisfaction levels drop significantly when they have to talk to more than one person to process a claim. The benefits carriers receive from automation in terms of fewer touches and faster cycle times have a direct positive impact on the consumer experience. 57% of consumers indicate they are fairly or very comfortable with automated processes. The demand from consumers for self-service options is driven mostly by the younger generations. Even the consumers who are the most supportive of automated processes still want a personal touch when they need it (for example, first time claimants). The overarching theme from these insights is that carriers who take an empathic and responsive approach to their consumers’ wants and needs and offer a personal touch when and where it’s needed will emerge as the winners in today’s increasing competitive insurance market. Overall, the results are very positive and point to the expansion of claims automation into the future―for the mutual benefit of carriers and their customers―as long as carriers listen to their customers and provide a personal touch when necessary. This includes using the communication method of their customers’ choosing. Carriers can improve automation-related decision-making by understanding consumer profiles. It’s reasonable to assume consumers will seek self-service options even more in the future – particularly as the consumer base expands to include more technology-savvy young people. Carriers must adapt their processes to meet that demand while ensuring they’re making self-service options easy for consumers and offering a personal touch at the right time. You can get more details about our study, the results, the implications and the carrier perspective in our 2019 Future of Claims Study―Balancing Claims Automation and Empathy. Be sure to check out the infographic below.